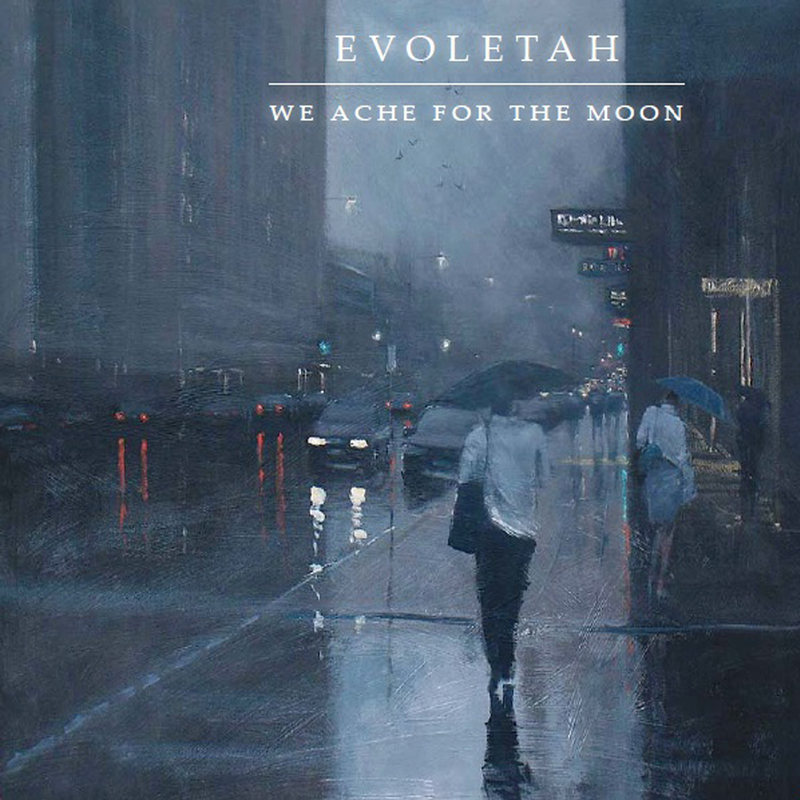 In the summer of 2012, Australian alt-rock quartet Evoletah released their third album ‘Sleepwalker’. While often showing the makings of a talented bunch of musicians, a lot of the material was indistinct; there were individual tunes to be cherry-picked for enjoyment, but overall, the release felt somewhat samey. A year on, and similar to before, the mid-paced ‘The Forgetting’ presents a wholly melodic tune underpinned by a simple drum line providing a reasonable slab of jangle-pop/dream pop, where Evoletah show traces of influence from The Church. If anything, it’s a better result compared to anything on that previous disc, with the chiming guitars meshing with Cahill’s natural tones effortlessly, but overall, ‘We Ache For The Moon’ is a much better record than even this marked improvement suggests. Elsewhere, there’s cause for much jubilation, as a majority of the material on Evoletah’s forth record almost sounds like the work of a different band. Frontman Matt Cahill’s breathy vocals are very distinctive throughout, but musically the band has moved on so, so much. If you liked the alt-rock slants of ‘Sleepwalker’, then the more low-key ‘…Moon’ is possibly going to surprise you, if not knock you for six. The most obvious difference this time out is the presence of an extra band member, Ms Katie Underwood (ex-Bardot), whose jazzy woman-tones compliment Cahill’s understated style perfectly. This combination of brilliant voices is impressive during ‘Halfway’, a tune that melds a strong rhythmic line and ringing guitars effortlessly. Scratching below the Church-like surface (a comparison, once again, strengthened by Cahill’s vocal stylings), there’s a very impressive bassline weaving in and out of the harder edges…and all the while there’s a sense of something special building. Just beyond the halfway point, with the addition of crying lead guitars, Cahill and Underwood’s voices meet – and the emanating sounds – at first striking, marking a whole new chapter in the Evoletah story – soon sound like the most natural addition. ‘Time’ allows Underwood more scope as she takes the reign fully, placing her natural, crying vocal style over a cinematic piano line. A word away from anything on ‘Sleepwalker’, this voice – mixed with the classy piano and a jazzy bass – presents something unexpected. There’s something at play here which evokes a touch of ambient 70s prog amid it’s jazz pop leanings: maybe it’s the way it builds, or maybe it’s the worldless ‘Great Gig In The Sky’ moments, it may even be just the fact that it’s six minutes fly past leaving you pondering what it is you’ve just heard. Whatever it is that makes this so cerebral, you’ll certainly find yourself wanting to hear it again and again. Carrying over the slightly jazzy mood, ‘Guillotine’ makes equally good use of a bendy jazz bass, only this time pushing an electric piano to the fore. Cahill takes the lion’s share of the vocal – and this wandering style suits his voice far better than the band’s dark rock tones of yesteryear. With Underwood adding a lovely counter harmony while the bass and piano invite flourishes from strings and saxes, the end result is another thoughtful number which ranks as another album highlight. Going for something retro and wistful, ‘Everyone Waits for Nothing’ harks back to the English folk of Nick Drake, on a number resplendent with finger picked guitar, cello, and finger cymbals. It stands out among these nine tunes as being the starkest and most laid bare, but within that stripped down facade is a human warmth that pulls in the listener. 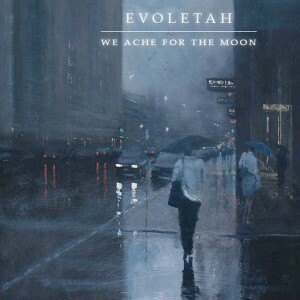 If these high points weren’t enough to ensure ‘We Ache For the Moon’ stands as Evoletah’s first true masterpiece, the gloomy ‘Eleventh Hour’ adds even more wonder. On this piano based tune, Cahill sounds completely at ease while fronting an arrangement with an almost gothic edge. With a nod to Nick Cave and forcing some almost unavoidable comparisons for the equally confrontational John Cale, this tune captures Cahill at his most confident. While there was never any doubt of his being an interesting and natural vocalist – even at times when Evoletah’s tunes weren’t anything too far out of the ordinary – this could be his finest four minutes. This entry was posted in Album & EP Reviews and tagged alternative, aussie, prog, underground classic by Real Gone. Bookmark the permalink.